As part of my recent move to the Bay Area, I’ve been trying to supplement the cool-weather closet options in my wardrobe. And as fall approaches, I’ve doing more and more thinking about how exactly I’m going to stay warm. I strongly dislike heavy coats because they often seem to weigh you down but their practicality can’t be denied — and so I was searching for something that would keep me toasty without the weight. Alas! I saw a photo of Rachel Zoe’s collar cape (currently sold out everywhere! ), fell in love and started searching for similar pieces. 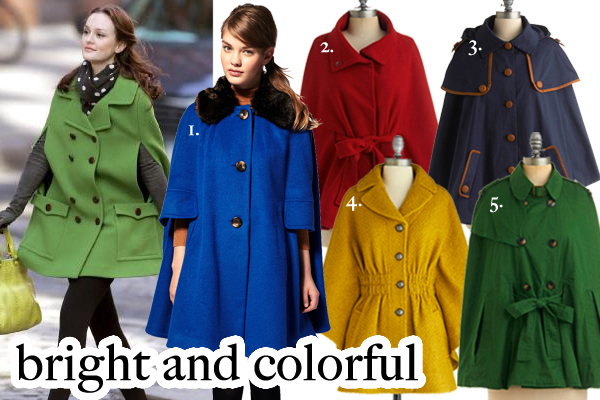 Capes are a fun alternative to the traditional jacket or coat, and they come in so many variations — colors, lengths, styles. And the best way to avoid looking like Superman or a witch while wearing a cape is to focus on its shape and color. Buttons, collars, belts and trim all help make your cape look fall fabulous rather than Halloween horrible. I love Blair Waldorf’s bright green cape here from this Gossip Girl image — especially with the polka dot scarf! It’s so Kate-Spade cute. Colors are definitely a continuing trend into fall and a cape or overcoat is a great way to spice up any outfit since you’ll always need something to keep you warm! This street style photo makes me drool. Her Chloe cape, with those perfectly distressed jeans and supple brown leather tote are such a wonderfully rich fall combination. I love the contrast trim as it helps the cape avoid looking like a piece of fabric or a blanket, adding dimensionality and interest. And finally, a more traditional cape shape — long and sleek. I love the arm holes and slits in these pieces and these capes take the cake with their elegant simplicity. Because capes have that bell shape, consider wearing skinny or straight-leg pants in order to maintain the proportions of your volume! However, a shorter cape can also look great with bell bottoms or flares — to truly embrace your inner 70s self! 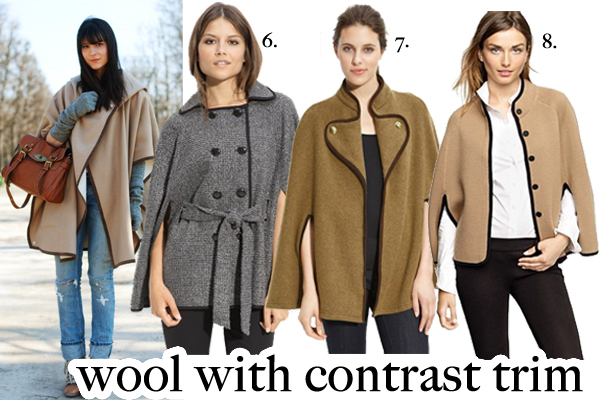 What outerwear will you be wearing this fall? I wasn’t really into this trend at first…but now I love it and can’t wait to own one!